This helpful Memo Minder plays back a pre-recorded message of up to 20 seconds, when motion is detected nearby. It can remind someone who is ill to take medication or leave the chain on the door before opening. Part of the Home Offices evaluated distraction burglary kit. It was the single most successful element of a 1300 home evaluation, and achieved an 80% increase in good doorstep practice. Adjustable wall mounting bracket included. Requires 4 x AA batteries (included). 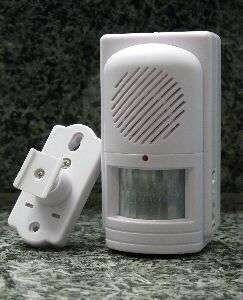 This helpful plays back a pre-recorded message of up to 20 seconds, when motion is detected nearby. It can remind someone who is ill to take medication or leave the chain on the door before opening. Part of the Home Offices evaluated distraction burglary kit. It was the single most successful element of a 1300 home evaluation, and achieved an 80% increase in good doorstep practice. Adjustable wall mounting bracket included. Requires 4 x AA batteries (included).